Gold is money. It provides wealth protection because it maintains its purchasing power better than paper currencies. At present, the world’s major currencies are suffering from significant losses in purchasing power. The Japanese yen, the British pound, the euro and the US and Canadian dollars have all lost 70-80 percent of their purchasing power against gold in the past ten years. Every paper currency ever printed has eventually lost purchasing power against gold. In fact, no fiat currency not backed by gold has succeeded as a stable store of value, and yet no gold-backed currency has ever failed. 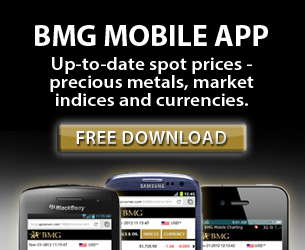 In reality, gold is not rising in value – currencies are losing purchasing power against gold. It is an inverse relationship, and this implies the price of gold can rise as far as currencies can fall. Currency printing is the only tool central banks have to fight the deflationary consequences of outsourcing, high unemployment, an aging population, endless war and the interest payments on the debt they are creating. 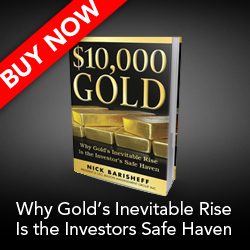 The currency crisis we are facing has created a perfect storm for gold. Gold is money that banks and governments cannot expand. Precious metals bullion is beyond the control of bankers and politicians – they cannot simply print more of it. Buying gold is, therefore, portfolio insurance against the failure of the policies and practices of banks and governments. Gold bullion is significantly less volatile than gold stocks. Even the best gold stocks sell off in a stock market decline, as witnessed in 1987 and 2008. Gold, however, has been less volatile than any of the Dow components over the last decade. Despite gold’s rising price, gold production over the past two decades has averaged an annual increase of only 0.7 percent. With the 2013 fall in gold prices and subsequent production cutbacks of costly projects, gold production is flat to negative as Chinese and Indian demand alone in 2013 will absorb most if not all of annual global mining supply. Even future growth shows little chance of increasing significantly. During the past two decades, only a handful of large gold deposits have been discovered, and these are in the far North or in politically sensitive countries like Ecuador. Even when gold is discovered, there are many hurdles to overcome on the road to production. Environmental restrictions, the threat of nationalization, heavy taxation and expensive infrastructure costs are but a few. The absence of any significant new land-based oil discoveries are causing the most expensive component of mining, the cost of energy, to rise steadily. After nearly two decades of net selling, in 2009, central banks began to reverse a generational trend by becoming net buyers of gold. Central banks will continue to be the largest buyers of gold over the coming decades, as they see the currency crisis ahead and look to diversify out of fiat currencies and into real money – gold. Today the Chinese government encourages its citizens to put 5 percent of their savings (and China has one of the highest savings rates in the world) into gold bullion. They will increase their buying as they see currencies continue to lose purchasing power. In 2013, Chinese and Indian buying alone accounted for all annual global gold production from mines. This demand for gold from the general public will spread to the West as people begin to understand the financial reality our economies are in. Central banks and the public will have competition from pension funds, sovereign wealth funds, insurance funds, mutual funds, hedge funds, private equity funds and private wealth funds, which have, collectively, over $100 trillion in assets under management (“AUM”). Pension funds with AUM of approximately $24 trillion currently have about 0.15 percent of their assets allocated to gold bullion. In other words, they have not even begun to move into gold. The large funds, the real movers of the financial markets, are beginning to acknowledge the need to hold gold in their portfolios. If they allocated only 5 percent of their AUM to gold, we would see substantially higher prices for the precious metal.